Lindsay has acted stupid enough in his first two terms to get reelected by the brain dead. Lindsay Graham will win no problem. Sorry Democrats, you got absolutely no chance to take this one. -do not elect this guy, very vicious. None of these idiots care USA anymore. Yeah, we know that well already, which means that we know what the whole country can wait from this guy for the next years. Hint: it's more or less akin to weight of the atom of hydrogen... only a lot lighter. Democrats have no chance? Uh, Isn't this a Republican primary race? 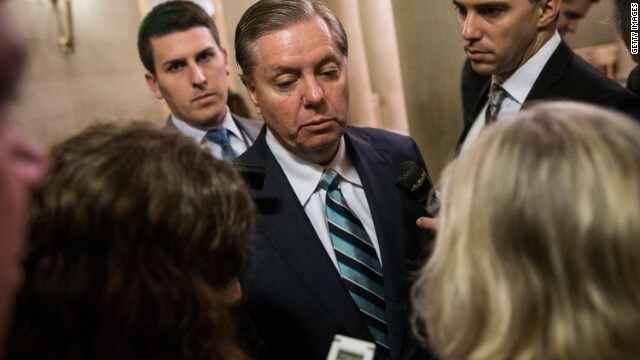 "Lindsay Graham will win no problem. Sorry Democrats, you got absolutely no chance to take this one." Someone has some serious reading comprehension problems! This race isn't ABOUT dems, honey! Summer school remedial reading classes haven't started yet, so you still have time to register – and you REALLY should! The Gop created the monster known as Tea Party fools giving in to their every whim. Now that they want to cut ties with them, they are voting out the GOP who are not truly conservative as far as the Tea party is concerned. Be careful what you ask for is the new motto for the GOP. They are in for a wild ride, because the Tea Party is chewing them up and spitting them out. LOL!!!!!!! Your in fine form today sweetie, lmao. But, oddly enough, your right, no democrat will win the gop primary, you guys are unstoppable, its just too easy sometimes. Finding it hard to stop laughing, thanks Donna, your a gem! Why aren't the RWNJs showing their support for Hannity and his pal Bundy who got two brain dead tea baggers to kill three people in Las Vegas. That what you baggers wanted, isn't it? Good question Tampa- They stirred that pot well, and they are remarkably quite on the results. The Taliban would have to be very good to kill as many Americans as the GOP/NRA does. From foreign to domestic dems have made us fall behind . And just wait and see whats coming down the road just abit . Just blame the dems and feel sad and embarrassed for supporting them . You will be sad anyway probably not embarrassed . Admittedly Lindsay Graham isn't the sharpest knife in the drawer. But neither is Tampa Tim !! Good Lord, what next? Ok Graham, we know you hate everything about Obama, that's a given. Tell us your plans for the american people. I'm sure you can find a hearing somewhere on that! ACA is law. Vote Hillary 16 go yes! Tea Party has been calling for armed attacks on the US from within. They got it. Any remorse or soul(?) searching? Is SC where the brains of its citizens only work 1/4 of the time. Ms. Lindsay will get reelected and wear her little pink tutu while she sits in her porch and drinks mint tea. I love it when the malignants of the rightwing underbelly eat their own. It should be no surprise that "Lindsay Graham isn't the sharpest knife in the drawer". After all each [R] campaign is a race to the bottom, and Miss Lindsay has already been a winner in that [R] degenerative process. And so why try to slander Tampa Tim by comparing him to a known [R] regressive pot-hole? Tampa Tim merely asked a relevant, thought-provoking question. Oh, that's right, to [R]s "thought provoking" is like saying "measles" to the rest of us. We shall see how it goes. Graham may win, but I suspect he will drop significantly, in his voter support, just the same. I certainly did NOT vote for him. There were better options. In the valley of the blind the one eyed man is king .